Eat low fat and lose weight. Among other secret things! 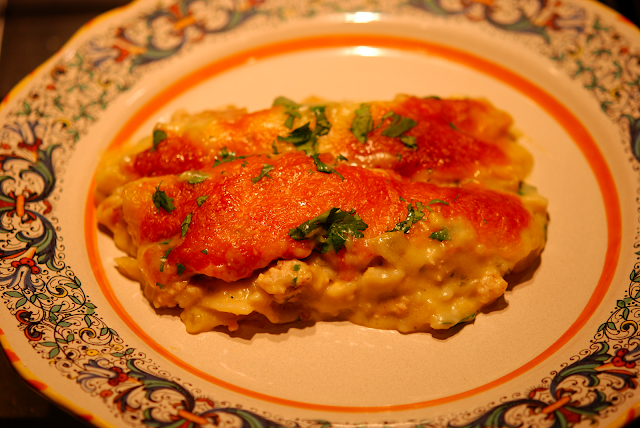 My next recipe is Green Chili Turkey Enchiladas. I want to reduce the fat in my diet, for obvious reasons, so I decided to try ground turkey in one of my favorite things to eat, enchiladas. I used ground turkey instead of ground beef or chicken because I had it in the refrigerator and I wanted to see how it would taste. I did not use to be a fan of ground turkey. But it is low in fat and I realized very quickly that it is a great substitute for ground beef, you just have to season it correctly. 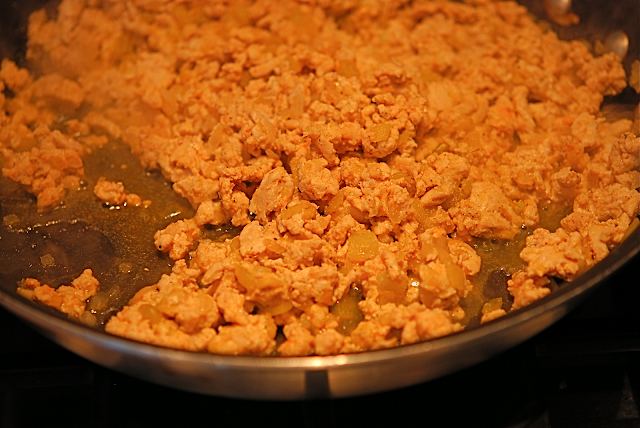 Ground turkey breast has 1.5g of total fat for a 4oz. serving size. 94% less fat than regular ground beef.. Don't get me wrong, I love beef. I am an avid beef eater. But in the spirit of less fat and losing weight I decided to convert some of my favorite recipes to a lower fat version using ground turkey or chicken. 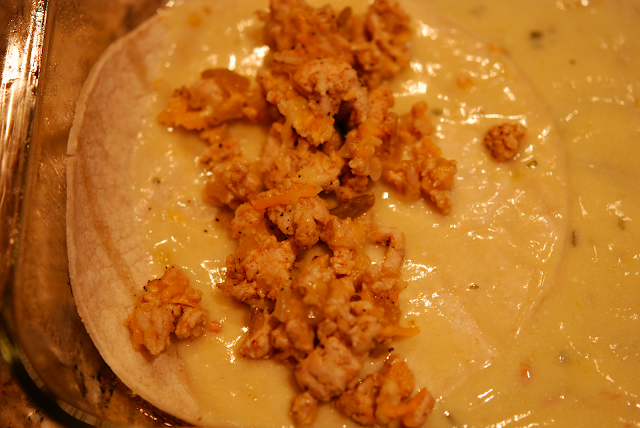 In the coming months I will be sharing more recipes with ground chicken and ground turkey. 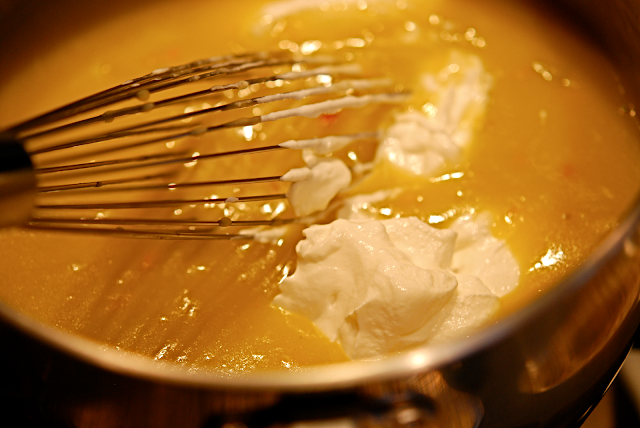 Remember when cooking with either turkey or chicken you need to add moisture and seasonings. Otherwise it tastes like cardboard. 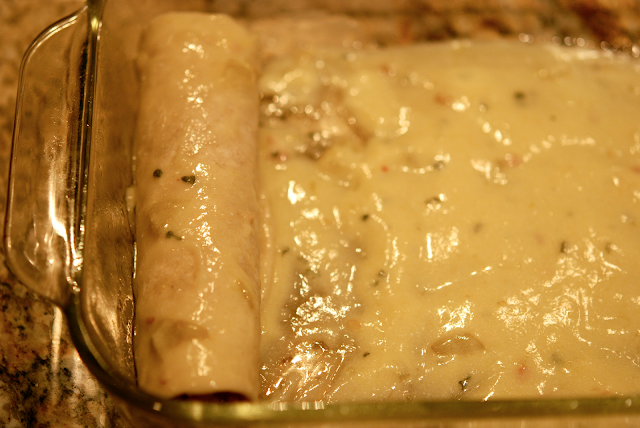 So with that being said I created a new green enchilada recipe using ground turkey breast. I made this last night and it was fantastic and I did not miss the beef! Even the left overs today tasted just as good as it was yesterday. 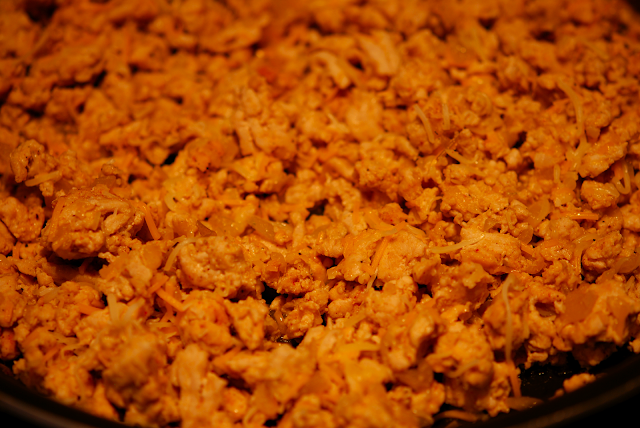 Spray a large skillet with cooking spray, crumble ground turkey and add chopped onion, salt, pepper, cumin, garlic powder and chili powder. 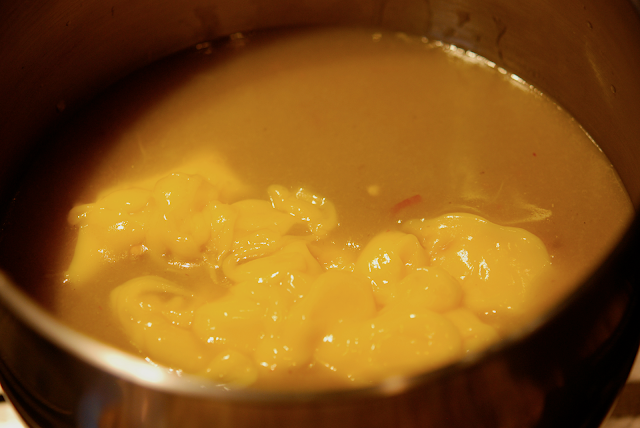 Cook until meat is browned then add ½ of the can of green chilies. Cook for 1-2 minutes to cook out the moisture. 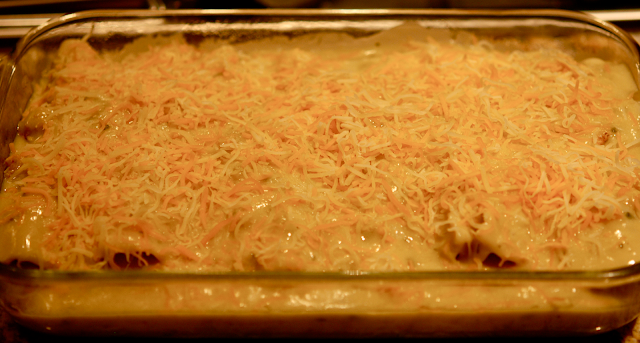 When meat is cool add 1/2 cup shredded cheese, set aside. 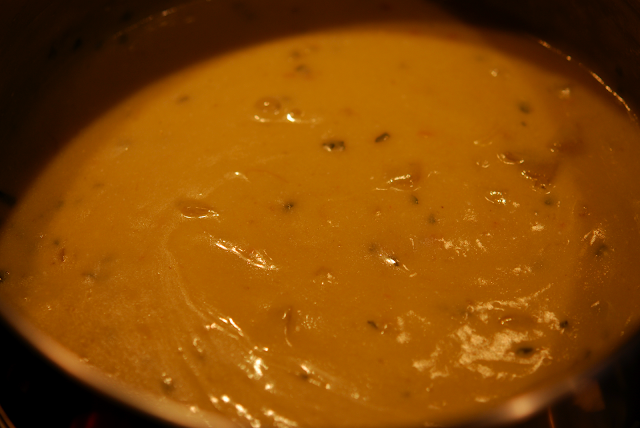 In a large saucepan add 2 cans of green enchilada sauce, the remainder ½ can of the chopped green chilies, 1 can cream of chicken soup, blend well and heat up over medium low heat. When it gets hot then add the sour cream and cilantro, mix thoroughly. 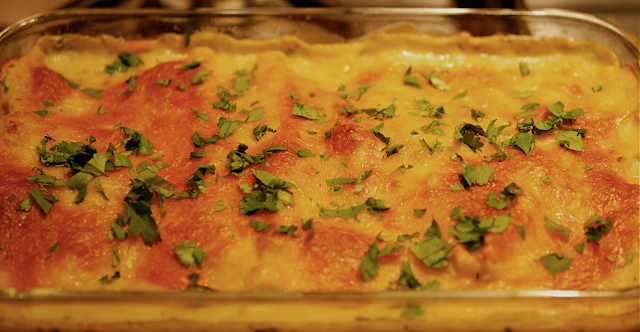 Coat a 9x13 inch-baking dish with cooking spray, add a little sauce to pan and spread around. and roll up placing seam side down. Repeat until pan is full. Then add remaining sauce and meat over enchiladas. Spread remaining 1 cup of shredded cheese over the top and bake in a pre-heated 375 degree oven for thirty minutes or until hot and bubbly. Spray a large skillet with cooking spray, crumble ground turkey and add chopped onion, salt, pepper, cumin, garlic powder and chili powder. 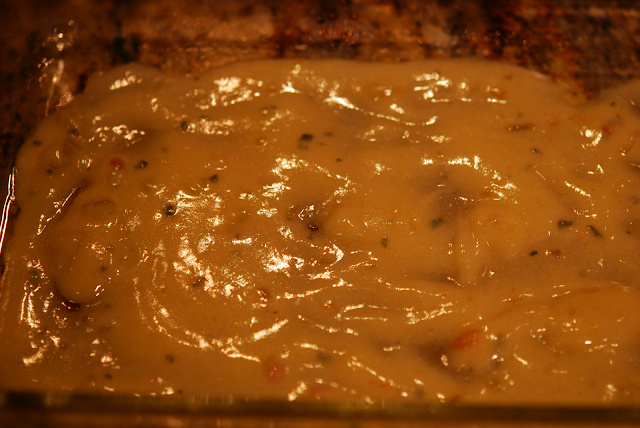 Cook until meat is browned then add ½ of the can of green chilies. Cook for 1-2 minutes to cook out the moisture. Set meat aside. When cool add ½ cup of shredded cheese and mix throughout. 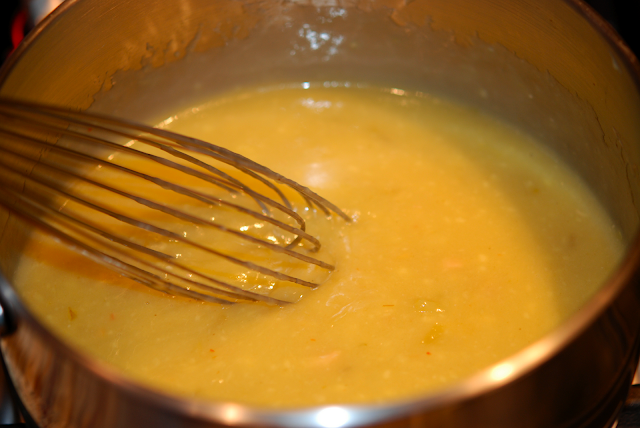 In a large saucepan add 2 cans of green enchilada sauce, the remainder ½ can of the chopped green chilies, 1 can cream of chicken soup, blend well and heat up over medium low heat. When it gets hot then add the sour cream and cilantro, mix thoroughly. 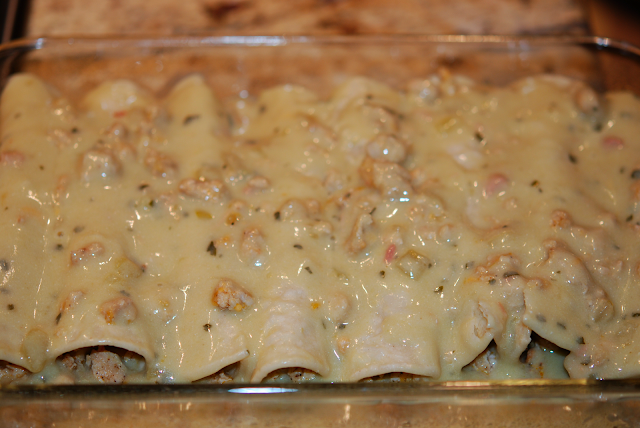 Coat a 9x13 inch-baking dish with cooking spray, add a little sauce to pan and spread around. 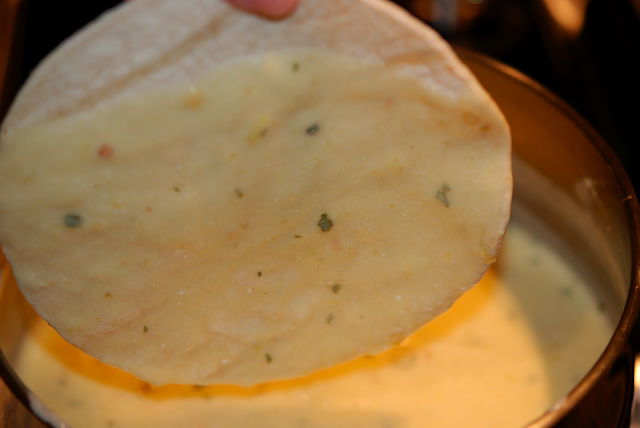 Dip a tortilla in the hot enchilada sauce for 10 seconds or until a little flexible (this is make it easier to roll), place the tortillas in pan, spread 1 tablespoon of meat down the middle of the tortilla and roll up placing seam side down. Repeat until pan is full. Then add remaining sauce and meat over enchiladas. Spread remaining 1 cup of shredded cheese over the top and bake in a pre-heated 375 degree oven for thirty minutes or until hot and bubbly. 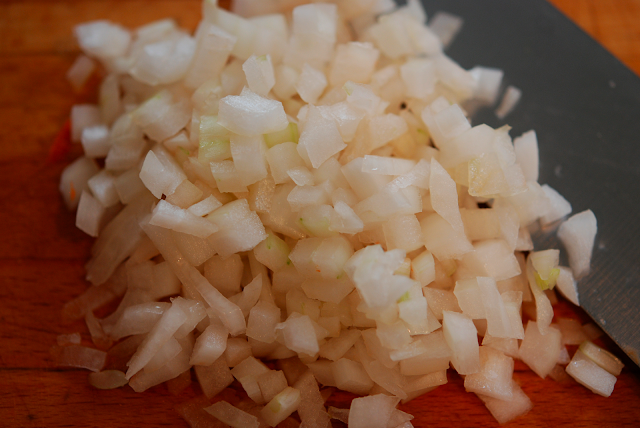 Garnish: with chopped fresh cilantro, sour cream or green salsa. Looks delish! Glad you are getting on the ground turkey wagon- we eat it all the time. I will have to try this recipe for Jer. Thanks Mrs. B! 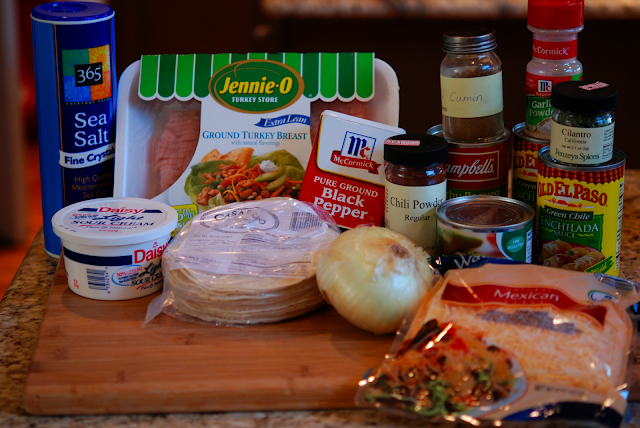 I Making this for dinner tonight. I didn't have turkey though. 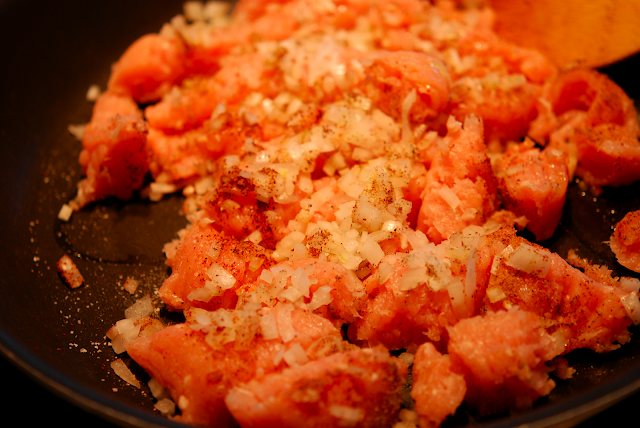 I substituted boneless chicken breasts that I poached and shredded. I'm still making your Friday Night Turkey Burgers. You never disappoint. I'm sure they will great with chicken too! Thanks for the nice comment. Keep on cooking!